Details of upcoming Intel processor, codenamed Haswell-E, have been leaked by VR-Zone. According to a few slides, Intel plans to release a new high-performance platform in the second half of 2014. While Intel plans to release Ivy Bridge-E later this year for the well-established X79 socket, Haswell-E will come with its own platform, codenamed Wellsburg, and the new 2011-3 socket. The all-new high-performance desktop platform is said to implement some advances geared toward greater performance. Notably, a quad-channel DDR4 memory configuration for enhanced bandwidth over current DDR3. The processor itself will be an evolution of newly released Haswell mainstream processor. According the same slides, it would be built on Intel’s current 22nm fabrication process. Haswell-E is expected to pack up to 8 cores with support for HyperThreading, for a total of up to 16 threads, effectively doubling the core/thread count of mainstream Haswell. The leaked graphics claims a 55% performance increase over the 4 core parts, which doesn’t really add up as doubling the number of cores alone should yield a 100% performance increase. Increases over IVB-E are said to be in the 30% range. Never mind the guy doing the math there. Apart from the number of cores and DDR4 support, the new processor should implement 40 third generation PCI-E lanes for 2×16 or 4×8 SLI/CrossFire discrete graphics configuration. The CPU itself will not feature a built-in GPU like mainstream parts. 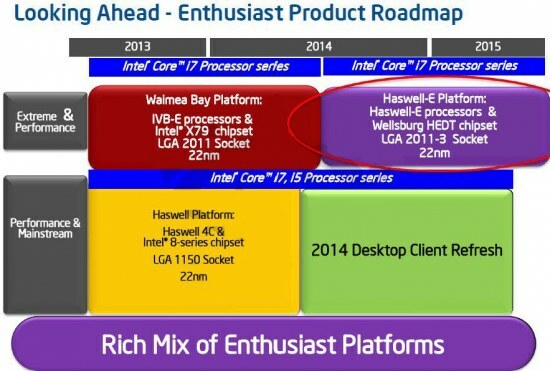 Leaked slides also point to an Haswell refresh in mid-2014, which would show up just before Haswell-E in the same manner as Haswell showed up before IVB-E is expected to be released.